Facebook is slowly connecting people even if they don’t know each other. It’s also a get avenue to find viral videos and get a following. Some videos get viral for being funny, some for being heartfelt. Another Facebook video struck the netizens straight to the heart, even if he’s singing in an “off-beat note” and even if no one is wowing from his vocal talent. Aptly titled “Namamasko po”, the little guy’s greeting all a “Merry Christmas” through his song. Meet Jann Anthony Gabutan, entertaining fb-dom with all his cute antics by making funny faces. Jann Anthony simply is just happy singing his heart out with full stage performance level. After people watched his video, it Imbibes a light, fun, and happy feeling. It’s just what people need nowadays. It’s a needed break from all the drama, confusion, heartbreaks, bad mouthing and bad news lining fb-doms wall. 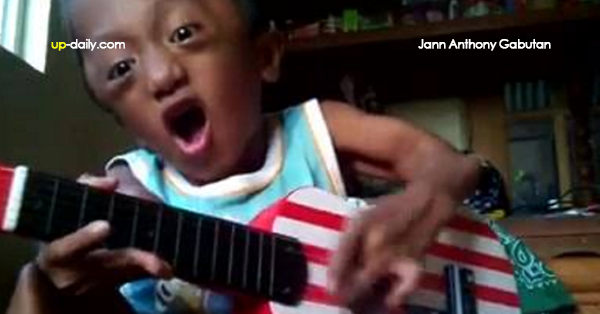 Being little doesn’t stop him from playing his little guitar — proof that there’s never a hindrance when you want to achieve or learn something. After getting a “Cuteness overload” comment from one of his viewers, he has spread happiness and cheer this Christmas season. Commenters are even requesting more videos from him. So, we must watch out for this little guy. Maybe he, too, can get the chance to be featured on “The Ellen Degeneres Show” as the other lucky video posters that caught Ellen’s eye! One can appreciate what Facebook does to help people get noticed and touch other people’s lives.